Whether you are pricing crafts or handmade jewelry, the success of your business and the salability of your work will be greatly affected by your price points. Pricing a handmade product is much different than pricing products that can be readily purchased in the marketplace. Unless you are creating items that follow a specific trend and you are virtually copying a design that is widely available, pricing crafts is not like comparing apples to apples. Unlike comparing prices on standard items such as printer ink or a filter for your air cleaner, competitive pricing on handmade items rarely works. Most people know what the best price is for printer ink, but how does anyone establish what is a good price for a handmade product? When you are selling handmade jewelry or crafts customers will pay the price that fits the value of the work. What is the value of the work? Read on and discover what you need to consider before arriving at appropriate price points for your work. No Room for Growth: The first reason why pricing your work too low will actually stop you from prospering is that low prices do not allow any room to expand your business. Pricing crafts or jewelry should include the cost of your materials, the cost of labor, the availability to establish the right wholesale prices for your collection, as well as covering any overhead costs that you may incur in your business. Let's start with the cost of labor. Take into account that if you want to grow your business you will need to charge appropriately for hired labor. Perhaps you may be able to knock off 15 necklaces in a day, but can you consistently produce that many necklaces using hired labor? Knowing what you can reasonably expect, in terms of production time, from hired help will assist you in determining what you need to charge per item, at wholesale, in order to grow your business. Even if you don't plan to wholesale your work right away, it may be something you will consider in the future. Planning for that possibility when you are first starting your collection will ensure that you can divide your retail figures in half should the time come for wholesaling your line. Ideally then, your pricing should be high enough that you can wholesale your work, pay for hired labor and still see a healthy profit with room for growth. Pricing too low will impede your business success if it means that you will forever be your own factory because you have not allowed room for hiring assistants to aid in your production. It's all Subjective: Provided you have a market for your paper mache hats, who's to say they are too expensive? Likely there aren't a whole lot of paper mache artists making hats like yours so it will be you that sets the value of your work. Really you can set any price for your work, but in practical terms, you will want to set those prices realistically by considering what the market will bear. With some experimentation you will find what the cap is for pricing your work on a higher scale. To a large extent, what any given piece is worth is subjective because handmade work is all about perceived value. 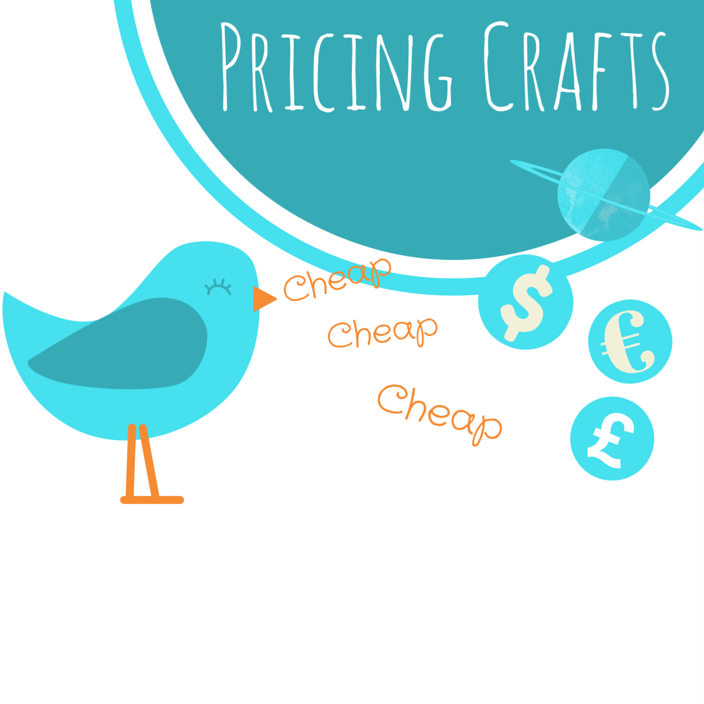 Pricing crafts too low oftentimes leads to the perception that your work is not very valuable, while pricing crafts higher can position your handmade goods as items of quality and skilled workmanship. Selling handmade jewelry for ten dollars or less, most times, tells your potential buyer that your items are either cheap in quality or that they have little real value. What is real value? Sometimes it may be the materials you are using and the skill that goes into your work, while other times it is simply the perceived value of goods based on the prices you are asking in exchange for your work. Not being able to establish your collection as one of distinct quality by pricing too low will not only result in less money for your work, but oftentimes less sales. Logic says that if your products are priced low you will sell more, when in reality you may sell more when your prices dictate that your items have more value. Why do people buy iPhones when they can have an Android at a fraction of the cost? Because Apple has positioned themselves in the marketplace as a leader in quality, innovation and status. You may have noticed a trend in the food business where companies are applying strategies for creating a higher perceived value, much like in the handmade industry. Food product advertising now uses terminology that allows for a higher pricing formula by equating the product features with the handmade market. We see this in product descriptions such as "hand tossed pizza", "hand cut fries" and "artisan bread." It may seem humorous given that we know the bread isn't actually made by a fine art graduate, but the idea is that it is a quality bread invented by a culinary genius. On a last note on craft pricing and how you can position your products to command higher prices, I would like to share a first-hand experience of my own. For a number of years I have manufactured barrettes which sell for more for than most people are typically willing to pay for a hair accessory. These barrettes don't sell themselves and most people who visit our craft show booths pick up the barrettes and balk at the prices. Until we talk to them about how the barrettes are made, the materials we use and our iron clad guarantee, they usually cannot imagine spending $38 or $52 on a barrette. I charge more for these items because they cost a little more to produce and they are hand-soldered. Once people hear about the quality, durability and guarantee, they shift from a "that's too expensive" state of mind to an "I need that" feeling. What we did was solve a problem in the market by producing an alternative to an item that is notorious for breaking. Not only do we ensure that there will be no mechanical failure we also stand behind our product with an iron-clad guarantee. Secondly, we provided a quality barrette that is beautiful in design in a market where there is little to be found in terms aesthetically pleasing barrettes. While there are some lovely barrettes out there, they are typically glued which cannot withstand years of wear. Year-after-year we see return customers looking for new designs and happy to show us how their barrettes have stood the test of time for ten plus years. What's more amazing is that a good percentage of these buyers had no intention of spending that kind of money on a barrette and yet they have become devoted customers. You can create a loyal following for your work by designing fabulous products, filling a need in the market and offering a guarantee. When you do, you can price accordingly. Pricing crafts at a higher price point is all about creating perceived value and then delivering on that promise of quality. The Competitive Arena: Underpricing your work puts you in a competitive arena. Arguably the worst kind of competitiveness in the handmade market is that of the financial kind. 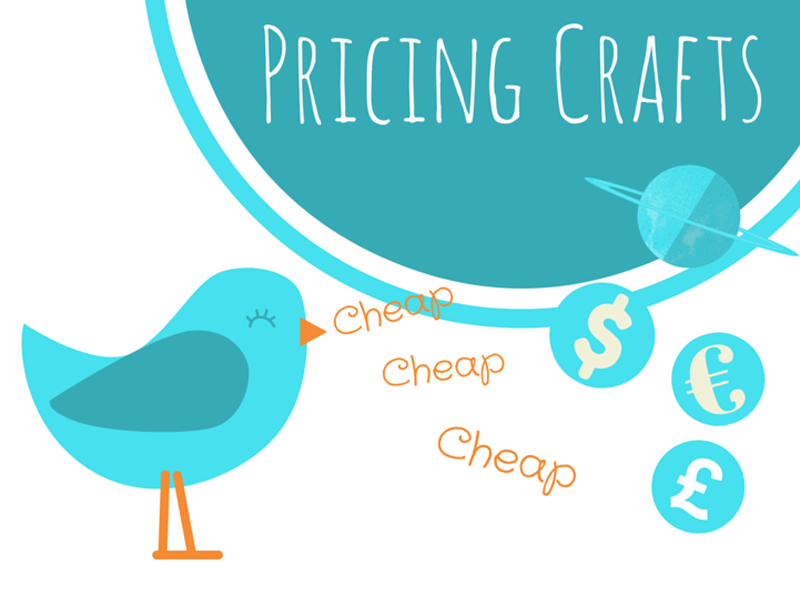 Pricing crafts to appeal to bargain hunters will not only attract the worst kind of buyers, it will also attract competing business. Stepping into the realm of attracting buyers in a marketplace such as Etsy, with cheap price points, will invite other craftspeople to undercut your prices. Then you shift the focus onto the cheapest price and not the best product. You will not only attract the kind of buyers that you hate to sell to, you also will not gain the respect of the discerning buyer because that buyer is not looking for cheap items. Quality buyers are looking for quality designs that they love. Pricing crafts too low to compete with other sellers is “reactionary pricing” and while undercutting may work in the grocery store, it is the beginning of the end in the handmade market. In order to be successful you need to look at being proactive in your design innovation, your marketing and how you set your prices. Intentional pricing means that you have tested and measured in order to arrive at the price points that attract your specific buyer. Pricing your work low because you feel unsure of how much to ask for your designs will likely result in an undefined or unpredictable audience for your business and, at worst, no audience at all. Design and price for the kind of customers you would love to have and you will have a solid foundation on which to grow your business. Decide early in the game that you will grow a high standard for your work and, in turn, you will be able to command the prices that your work deserves! Return from Pricing Crafts to Selling Handmade Jewelry.